This is a collection of a few unique projects. These were commissioned from an art gallery in Philadelphia. They wanted unique chairs fabricated from used shopping carts. This is an example of the steel flowers I make for Valentines day. They will be available soon on Etsy. This was fabricated from a normal walker for my close friend. She had trouble getting to her garden so we put small bicycle tires on the front and made skis so it would go over dirt and rocks. This is a table lamp made from recycled forklift chain and a scrap piece of 6" channel. This is a spiral steel mobile that we made for a local artist. It was featured in the Greenwich Art Gala and is currently up for sale. 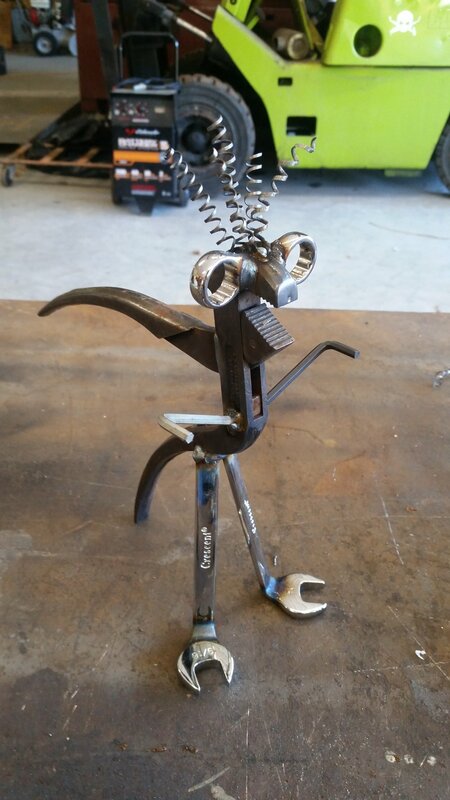 This was an animal that was made from a pair of pliers, some left over hardware, and turnings from threading a rod. It was donated for the Springfield Community Day. This was a stainless steel weather vane for a customer in bucks county. It was mounted on top of a cupola during a barn restoration. This was a scrap dinosaur I made for a raffle at an art show. It features a pair of pliers for the body and self tapping screws for its spikes. This is one of a few ladders I made for the Wallington school district to access their new roof. They are hot dipped galvanized for maximum durability.